Some eye disorders can only be successfully treated with early diagnosis. In addition, reading or spelling errors, legasthenia or asthenopic complaints are consequences of a visual impairment. A professional general and specific clarification of complaints is therefore essential for the healthy development of your child. If an infant reaches the 6th-8th week of life without making eye contact and does not “smile” at the parents, there is usually a case of delayed visual development. This can have very innocuous reasons – such as the possibility that, in the context of a generally delayed development, the visual development also occurs late. When nystagmus or markedly uncoordinated eye movements develop around the 8th week of life, clarification must be performed of any congenital organic eye disorders (e.g., optic nerve underdevelopment, retinal or optic nerve clefting) and neurological disorders. In the latter case, surgical therapy is often not possible, but early sight promotion can significantly improve the visual development despite the presence of eye disease. In the first year of life some children have pseudo-strabismus (“slight squint”) – due to the infant’s characteristic eyelid (epicanthus) and the broad bridge of the nose. In any case, it must be clarified whether there is a “true squint”. With a “true squint” it is necessary to start progressive therapy immediately. Sudden squinting in preschool or school children also requires careful clarification – in some cases, collaboration with a child neurologist is advisable. With mini-squinting (microstrabismus), the squint angle is very small and therefore inconspicuous, so that the squint is often not recognised. Nevertheless, it may result in poor eyesight (amblyopia), which can later no longer be treated. So an eye examination in preschool age is generally recommended. If the impression is given that a pupil shows up as whitish or appears “strange” depending on the angle of view, immediate clarification is required. Especially in the first year of life any suspicion of abnormal pupil illumination must be checked as soon as possible. There may be innocuous causes behind it – such as retinal clefts or a cataract. What is very dangerous, however, is a retinal tumour that can develop in childhood during the first years of life (retinoblastoma). Only early diagnosis allows the rapid therapy required for healing. A clouding of the eye lens – referred to as cataract or congenital cataract – may occur unilaterally or bilaterally, be present at birth or develop during the first years of life. With bilateral cataract the cause can be one of many, very different clinical profiles: it may be a pure eye disease (such as an inherited cataract). Cataract, however, can also be a partial symptom of a general disease (syndrome), arising in the context of a neurological disorder or a metabolic disease. A frequent indicator of unilateral cataract is when one eye looks noticeably smaller than the other. Only the total cataract can be seen from the outside – that is, if the entire lens is clouded. The pupil is then no longer black, but appears whitish-greyish. Early surgery must be performed. In neonates congenital cataract must be operated on even during the first few weeks of life (at the latest by the 3rd month of life), so that it does not cause irreversible impairment of visual development. In conspicuously large (“beautiful”) eyes, which are caused by an oversized corneal diameter, there is a suspicion of increased eye pressure. This leads if prolonged to optic nerve damage (= glaucoma). Other symptoms of glaucoma are photophobia, watery eyes and an increasing cloudiness of the cornea. Immediate therapy – possibly surgery – is required. Congenital hanging lid (ptosis) usually manifests itself in the first months of life. If the pupil is partly covered by the hanging eyelid – occasionally or constantly – patch therapy (occlusion therapy) of the healthy eye must be started. This supports the visual development of the affected eye. An operative correction is useful only in preschool age, as there is often an improvement in the first years of life. Congenital blood vessel tumours (“blood sponge” or hemangioma) can develop in the first year of life on the upper or lower eyelid. As with “hanging lid”, patch therapy of the healthy eye must begin as soon as possible. 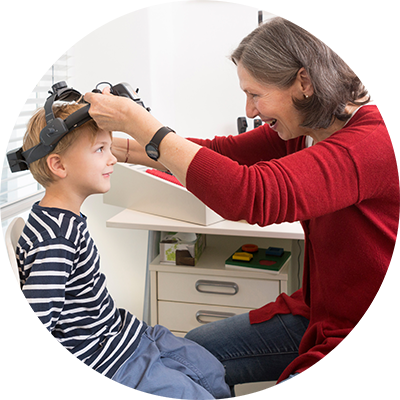 In cooperation with paediatricians and paediatric surgeons, various methods are used to reduce the size of the sponge so that the visual development of the affected eye is not impaired. Visually impaired persons have a visual capacity of no more than 30 percent. It is important to maintain a calm, relaxed atmosphere in the examination of visually impaired children – without any pressure. The focus must be on the use of vision in everyday life (functional vision): A visual impairment always has an influence on motor development and affects communication and social contact. So early visual promotion is essential for visually impaired children. Frequent tears of the eye which lead to an accumulation of tear fluid in the area of the lower eyelid and at the same time purulent discharges from the eyelid angle – without redness of the entire eye – indicate an innate tear constriction (congenital tear stenosis). Typical is an almost always unilateral appearance in the first weeks of life. Drip therapy helps in most cases. If it occurs repeatedly, it may be necessary to rinse the lacrimal ducts under a short-term anesthetic. Dyslexia is a developmental disorder that affects reading and spelling. It occurs despite normal intelligence, adequate educational support and no neurological disease or sensory deficit (WHO definition). Dyslexia, reading-spelling disorder (LRS) and counting disorder (dyscalculia) are not caused by abnormalities or disorders of the visual organ. So these developmental disorders are also no indication for treatment with prismatic lenses. Nevertheless, an ophthalmological examination is advisable in order to detect and treat any ocular causes of a reading disorder (such as farsightedness) in good time. In some persons with concealed strabismus (heterophoria) or not or incorrectly corrected refractive errors in the case of longsight, myopia or astigmatism asthenopic symptoms occur: These may be a pulling, squeezing or dull pain in the forehead – or fatigue and burning in the eyes, increased photosensitivity, feelings of pain, lack of stamina, blurred vision or double vision when working in close proximity or reading, as well as dizziness while driving and in crowds. These symptoms can increase up to nausea and vomiting and thus lead to a serious impairment of the person concerned. An organic disease of the eye must be considered and clarified in these cases. “Heterophoria” is not a separate diagnosis, but a possible result of the Haase measurement and correction method (HMC). The so-called Pola test is an important component in the clarification of asthenopic complaints. However, the test result can only be evaluated in conjunction with other test results, as the results could otherwise be misinterpreted. Which aids are most suitable for a visually impaired person requires careful advice and testing. Because as diverse as the eye disorders themselves are the resulting limitations of vision. A distinction is drawn between optical vision aids such as magnifying glasses, monocular binoculars and special filter glasses (edge filters) and electronic visual aids based on different computer systems. Other aids such as reading tubes and the correct lighting of the workplace can have a decisive influence on the need for magnification. Shall we play an eye game? Training the inner eye muscles. Lie down on the floor and close your eyes. 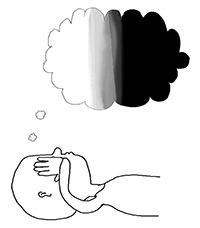 Lay your left hand flat on your left eye, so that it gets very dark. Then imagine in your mind how a light slowly goes on and gets brighter and brighter until it’s completely glaring – then you let the light go out slowly in your mind. Then put your right hand on your right eye and do the same exercise there. We ask you to listen to current information on the answering machine. Paid parking: Mon – Fri, 9 a.m. – 10 p.m.